Carbon capture, use, and storage technologies can capture more than 90 percent of carbon dioxide (CO2) emissions from power plants and industrial facilities. Captured carbon dioxide can be put to productive use in enhanced oil recovery and the manufacture of fuels, building materials, and more, or be stored in underground geologic formations. Almost two dozen commercial-scale carbon capture projects are operating around the world with 22 more in development. Carbon capture can achieve 14 percent of the global greenhouse gas emissions reductions needed by 2050 and is viewed as the only practical way to achieve deep decarbonization in the industrial sector. Even as nations diversify their energy portfolios, fossil fuels are expected to meet a majority of the world’s energy demand for several decades. Accelerating deployment of carbon capture technology is essential to reduce emissions from these power plants, and from industrial plants like cement and steel manufacturing. More than half of the models cited in the Intergovernmental Panel on Climate Change’s Fifth Assessment Report required carbon capture for a goal of staying within 2 degrees Celsius of warming from pre-industrial days. For models without carbon capture, emissions reduction costs rose 138 percent. For nearly a half century, in a practice called enhanced oil recovery (EOR), carbon dioxide has been used to extract additional oil from developed oil fields in the United States. U.S. companies are also investing in new technologies to re-use captured carbon emissions in innovative ways, including jet fuel and automobile seats. Spurred by the NRG COSIA Carbon XPRIZE, researchers are exploring even more uses, such as transforming carbon emissions into algae biofuels and building materials. There is strong bipartisan support to accelerate carbon capture deployment. In February 2018, Congress extended and expanded key financial incentives for investment in several advanced low-carbon technologies. The two-year budget package included the FUTURE Act, sponsored by Senators Heidi Heitkamp (D-N.D.), Shelley Moore Capito (R-W.Va.), Sheldon Whitehouse (D-R.I.), and John Barrasso (R-Wyo.). The legislation reforms and extends a federal tax credit to boost carbon capture, known as Section 45Q. The FUTURE Act also allows for the first time use of the tax credit for capture of carbon monoxide from industrial facilities like steel mills, direct air capture of CO2 from the atmosphere, and for the conversion of captured carbon into useful products. As of 2017, at least 21 commercial-scale carbon capture projects are operating around the world with 22 more in development. Industrial processes where large-scale carbon capture has been demonstrated and is in commercial operation include coal gasification, ethanol production, fertilizer production, natural gas processing, refinery hydrogen production and, most recently, coal-fired power generation. 1972: Terrell gas processing plant in Texas. A natural gas processing facility (along with several others) began supplying CO2 in West Texas through the first large-scale, long-distance CO2 pipeline to an oilfield. 1982: Koch Nitrogen Company Enid Fertilizer plant in Oklahoma. This fertilizer production plant supplies CO2 to oil fields in southern Oklahoma. 1986: Exxon Shute Creek Gas Processing Facility in Wyoming. This natural gas processing plant serves ExxonMobil, Chevron, and Anadarko Petroleum CO2 pipeline systems to oil fields in Wyoming and Colorado and is the largest commercial carbon capture facility in the world at 7 million tons of capacity annually. 1996: Sleipner CO2 Storage Facility offshore of Norway. This project captures CO2 from gas development for storage in an offshore sandstone reservoir. It was the world’s first geologic storage project. Roughly 0.85 million tonnes of CO2 is injected annually for a cumulative total of over 16.5 million tonnes as of January 2017. 2000: Dakota Gasification’s Great Plains Synfuels Plant in North Dakota. This coal gasification plant produces synthetic natural gas, fertilizer, and other byproducts. It has supplied over 30 million tons of CO2 to Cenovus and Apache-operated EOR fields in southern Saskatchewan as of 2015. 2003: Core Energy/South Chester Gas Processing Plant in Michigan. CO2 is captured by Core Energy from natural gas processing for EOR in northern Michigan with over 2 million MT captured to date. 2008: Snøhvit CO2 Storage offshore of Norway. CO2 is captured from an LNG facility on an island in the Barents Sea. The captured CO2 is stored in an offshore subsurface reservoir. To date, more than 4 million tonnes of CO2 have been stored. 2009: Chaparral/Conestoga Energy Partners’ Arkalon Bioethanol plant in Kansas. The first ethanol plant to deploy carbon capture, it supplies 170,000 tons of CO2 per year to Chaparral Energy, which uses it for EOR in Texas oil fields. 2010: Occidental Petroleum’s Century Plant in Texas. The CO2 stream from this natural gas processing facility is compressed and transported for use in the Permian Basin. 2012: Air Products Port Arthur Steam Methane Reformer Project in Texas. Two hydrogen production units at this refinery produce a million tons of CO2 annually for use in Texas oilfields. 2012: Conestoga Energy Partners/PetroSantander Bonanza Bioethanol plant in Kansas. This ethanol plant captures and supplies roughly 100,000 tons of CO2 per year to a Kansas EOR field. 2013: ConocoPhillips Lost Cabin plant in Wyoming. The CO2 stream from this natural gas processing facility is compressed and transported to the Bell Creek oil field in Montana via Denbury Resources’ Greencore pipeline. 2013: Chaparral/CVR Energy Coffeyville Gasification Plant in Kansas. The CO2 stream (approximately 850,000 tons per year) from a nitrogen fertilizer production process based on gasification of petroleum coke is captured, compressed and transported to a Chaparral-operated oil field in northeastern Oklahoma. Energy is captured at a rate of approximately 1,000 tons per day and injected into a nearby oil field operated by Core Energy in the Northern Reef Trend of the Michigan Basin. 2013: Petrobras Santos Basin Pre-Salt Oil Field CCS offshore of Brazil. This project involves capturing CO2 from natural gas processing for use in enhanced oil recovery in the Lula and Sapinhoá oil fields. 2014: SaskPower Boundary Dam project in Saskatchewan, Canada. SaskPower completed the first commercial-scale retrofit of an existing coal-fired power plant with carbon capture technology, selling CO2 locally for EOR in Saskatchewan. 2015: Shell Quest project in Alberta, Canada. Shell began operations on a bitumen upgrader complex that captures approximately one million tons of CO2 annually from hydrogen production units and injects it into a deep saline formation. 2015: Uthmaniyah CO2-EOR Demonstration in Saudi Arabia. This project captures CO2 from the Hawiyah natural gas liquids recovery plant. The captured CO2 is used for enhanced oil recovery in the Ghawar oil field. 2016: Abu Dhabi CCS Project Phase 1: Emirates Steel Industries. Carbon capture technology was deployed for the first time on an operating iron and steel plant. The captured CO2 is used for enhanced oil recovery by the Abu Dhabi National Oil Company. 2017: NRG Petra Nova project in Texas. NRG completed on time and on budget a project to capture 90 percent of the CO2 from a 240 MW slipstream of flue gas of its existing WA Parish plant, or roughly 1.6 million tons of CO2 per year. The CO2 is transported to an oil field nearby. 2017: ADM Illinois Industrial Carbon Capture & Storage Project. Archer Daniels Midland began capturing CO2 from an ethanol production facility and sequestering it in a nearby deep saline formation. The project can capture up to 1.1 million tons of CO2 per year. Carbon capture technology has been deployed at several industrial projects in North America dating back to the 1970s but its application to power generation is relatively recent. Pre-Combustion Carbon Capture: Fuel is gasified (rather than combusted) to produce a synthesis gas, or syngas, consisting mainly of carbon monoxide (CO) and hydrogen (H2). A subsequent shift reaction converts the CO to CO2, and then a physical solvent typically separates the CO2 from H2. For power generation, pre-combustion carbon capture can be combined with an integrated gasification combined cycle (IGCC) power plant that burns the H2 in a combustion turbine and uses the exhaust heat to power a steam turbine. Post-Combustion Carbon Capture: Post-combustion capture typically uses chemical solvents to separate CO2 out of the flue gas from fossil fuel combustion. Retrofits of existing power plants for carbon capture are likely to use this method. Oxyfuel Carbon Capture: Oxyfuel capture requires fossil fuel combustion in pure oxygen (rather than air) so that the exhaust gas is CO2-rich, which facilitates capture. Once captured, CO2 must be transported from its source to a storage site. There are over 4,500 miles of pipelines for transporting CO2 in the United States for use in enhanced oil recovery, but more will be needed. 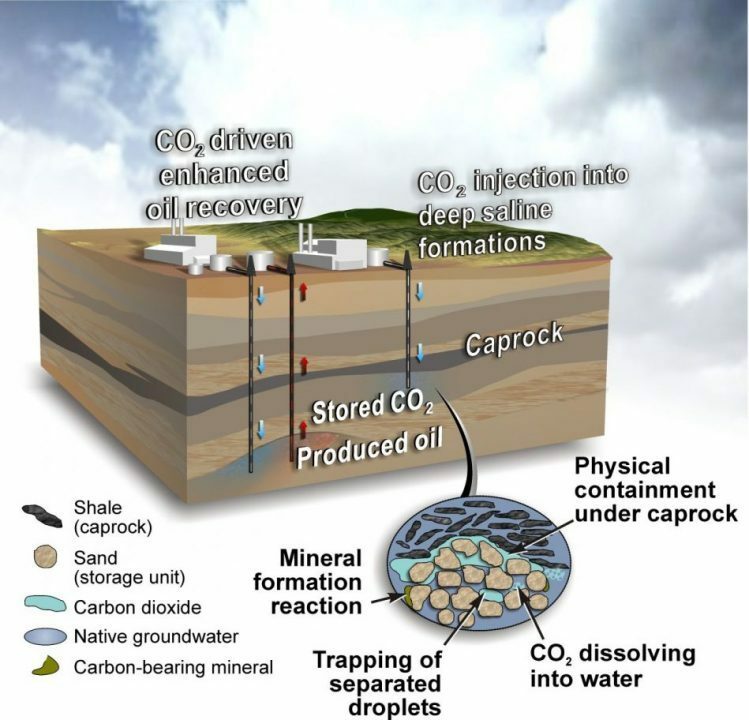 Oil and Gas Reservoirs (Enhanced Oil Recovery with Carbon Dioxide, CO2-EOR). Oil and gas reservoirs offer geologic storage potential as well as economic opportunity by injecting CO2 to extract additional oil from developed sites. Oil and gas reservoirs are thought to be suitable candidates for the geologic storage of CO2 given that they have held oil and gas resources in place for millions of years, and previous fossil fuel exploration has yielded valuable data on subsurface areas that could help to ensure permanent CO2 geologic storage. CO2-EOR operations have been operating in West Texas for over 30 years. Moreover, revenue from selling captured CO2 to EOR operators could help defray the cost of capture technology at power plants and industrial facilities. Deep Saline Formations. These porous rock formations infused with brine are located across the United States but have not been examined as extensively as oil and gas reservoirs. Coal Beds. Coal beds that are too deep or too thin to be economically mined could offer CO2 storage potential. Captured CO2 can also be used in enhanced coalbed methane recovery (ECBM) to extract methane gas. Basalt formations and shale basins. These are also considered potential future geologic storage locations. 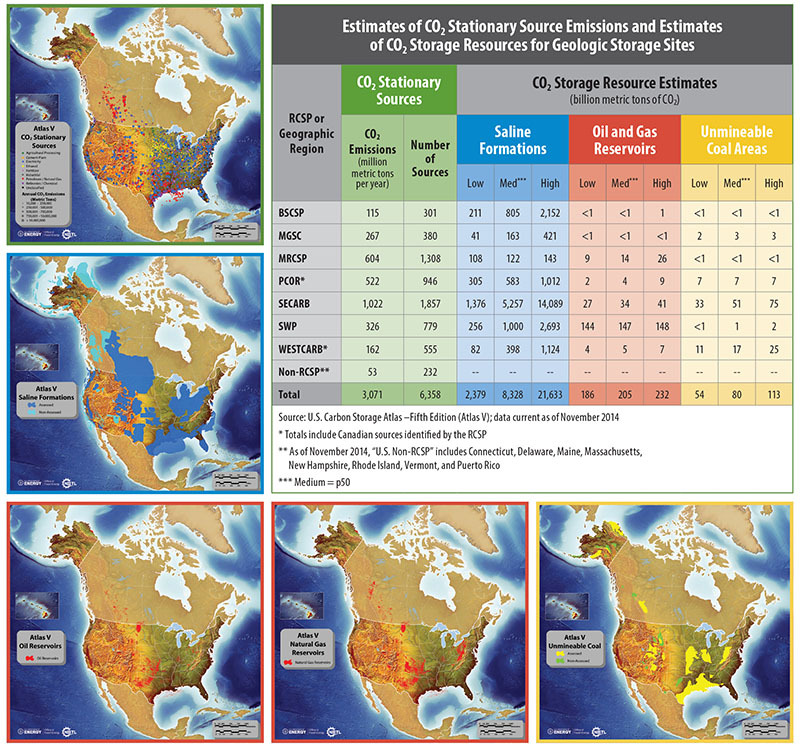 U.S. federal and state regulations cover CO2 storage site selection and injection. In addition, systems for measurement, monitoring, verification, accounting, and risk assessment can minimize or mitigate the potential of stored CO2 to pose risks to humans and the environment. CO2 injection in EOR wells is commercially proven and has a history of safely storing CO2 underground. For example, research by the University of Texas Bureau of Economic Geology found no evidence of leakage from the SACROC oil field where CO2-EOR has been performed since the 1970s. In the United States, the Safe Drinking Water Act and the U.S. Environmental Protection Agency’s (EPA) Underground Injection Control Program impose safety requirements on CO2 injection. In addition, the Clean Air Act and the EPA’s Greenhouse Gas Emissions Program require project operators to report data on CO2 injections and submit monitoring, reporting, and verification (MRV) plans if CO2 is injected for geologic storage. In addition, the Underground Injection Control Program requires previous seismic history to be considered when selecting geologic CO2 sequestration sites. The risk of small earthquakes causing CO2 leakage to the surface is mitigated by multiple layers of rock that prevent CO2 from reaching the surface even if it migrates from an injection zone.